Bill Campbell could be excused for deeming life as unlucky as a crooked draw. His mother died giving birth to him on September 7, 1923, in Atlantic City. Dad kept the secret from him till Bill was 11. He lived with his father, a traveling paint salesman, then aunts, then Dad again, changing schools six times. “By all rights,” said Bill’s wife, Jo, whom he married in 1947, “Bill should have become a criminal.” Instead, Campbell became “The Dean” of Philadelphia mikemen – airing every sport, it seemed, but curling and roller derby. Ultimately Bill treated retirement, paraphrasing Ring Lardner, like a side dish he declined to order – by 2013, still working, on the air for 73 of his 90 years. Campbell’s delivery was magnetic; his knowledge encyclopedic; his courage kinetic. It had to be to brave a term that stands alone, needing no elaboration. Nineteen sixty-four. Campbell called Wilt Chamberlain scoring 100 points – in one game in 1962. He broadcast a Philadelphia pro trifecta – the Phillies, football Eagles, and basketball ’76ers – “my favorite memory,” the Eagles’ last title in 1960. One night an elderly lady in New Jersey heard Bill’s baseball partner from Shibe Park, renamed Connie Mack Stadium in 1954: “Would you please talk a little louder?” she wrote baritone Byrum Saam. “My radio battery is getting weaker.” Some felt Campbell’s voice so strong you didn’t need a battery, merely open the window. Bill brought to every sport the intensity of his youth: It became an oasis, something to retreat to. At 6, he and Dad attended fils’ first big-league game, at Shibe Park, Campbell loving the geometry of the diamond. He took brevity for granted: With Lefty Grove pitching, a game might take an hour and a half. He also shared pere’s zest for tale and tune. Bill Sr. loved to sing ballads, his hero Enrico Caruso. Jr.’s hero was Dad, who remarried, then divorced – rare, even shameful, in the 1930s. Alone, the teenager turned to radio. He loved how it let a listener hear players jabber and feel pressure creep. In 1937, at Roman Catholic High in Philadelphia, Bill cracked announcing on a bare-boned 15-minute sports show. Major-league technology was slightly more chic. Most teams aired home games live. Away, line charges were pricier. Solution: wireless telegraphy, “[giving] play-by-play,” wrote The Sporting News, “within three seconds of the time it occurs.” An operator at the park sent code to a station: B1L meant ball one, low. An announcer could “re-create” a game unseen. Arch McDonald worked three blocks from the White House. Bill Dyer double-dipped the Philadelphia A’s and Phillies. Most used sound effects to mask being in studio. All helped broadcasting lodge in Campbell’s bones. A stick on hollow wood simulated bat on ball. The sound track included background noise. Nothing was real. Reality: It didn’t matter. In 1940 Campbell, 17, still in high school, began at a station in Atlantic City. Bill started play-by-play at minor-league Lancaster, Pennsylvania,, moving to WIP in Philadelphia in 1942, the year he entered the Coast Guard and did convoy duty in the Atlantic. At war’s end, 56 million radio receivers dwarfed television's 17,000. In 1946 and 1948, Campbell became WCAU Radio and TV sports director, respectively. Radio was an immovable object, selling 165,000 sets a month at peak. Slowly, TV grew into an irresistible force, vending 7 million in 1950. Before long the 20-something was among first to telecast Big 5 basketball at Philadelphia’s Palestra, hosted a popular daily radio show, co-hosted a Saturday-morning radio show and video series with A’s owner, manager, and patriarch Connie Mack – “Baseball’s Grand Old Man,” said Campbell – and did another sports show in grainy black and white on Channel 3 with mentor Stoney McLinn, once Ty Cobb’s ghostwriter. The program was titled The Kid and the Old-Timer. Campbell was “The Kid,” in 1946 starting play-by-play for the rookie Basketball Association of America Philadelphia Warriors – a league and team akin to pro wrestling, except that wrestling had a niche. (In 1949 the BAA and the National Basketball League merged to become the National Basketball Association.) In 2005 The Dean, 82, smiled, “[Now] I’m the old-timer.” With Jo and daughter Chris he drove to Springfield, Massachusetts, to get the Curt Gowdy Media Award from the Naismith Memorial Basketball Hall of Fame. “It never once entered my mind that I’d be eligible for a basketball award … but I think the Chamberlain thing probably helped a great deal.” How could it not – Wilt scoring 100 points – in a game? Clearly, there was nothing more for the Warriors to say, moving to San Francisco that summer. Staying put, Campbell managed a schedule that clung to him like vines around a trellis. At one time, he did 11 radio and three TV weekly shows, Warriors and Big 5 basketball, and University of Pennsylvania football at Franklin Field, its double-decked brick horseshoed home. Voice bobbing up and down, like a slip on the Schuylkill River, Campbell also aired America’s greatest rivalry. The Eagles liked to throw, quarterback Norm Van Brocklin strong-armed and -willed and Campbell’s close friend. Pete Retzlaff was a grand receiver; another, a 5-foot-10 Okie. “Van Brocklin’s got it,” said Campbell vs. the Giants. “He throws into the corner. All alone [to Tommy McDonald]! Touchdown!” Chuck Bednarik was the last to play both offense (center) and defense (linebacker) -- “amphibious,” Yogi Berra might say. Coach Buck Shaw intended to retire, Van Brocklin expecting to replace him. On Monday, December 26, 1960, the title game lured 67,352 to Franklin Field. “You can’t find a seat,” intoned Campbell, broadcasting on WCAU Radio, the telecast blacked out locally. By game’s end it was easy to see why. Two Paul Hornung field goals gave the Packers a 6-0 lead. Van Brocklin then hit McDonald for a 35-yard touchdown. A Philly field goal made the score 10-6. By turn, Green Bay forged a fourth-quarter touchdown (13-10); the Eagles scored on Ted Dean’s five-yard run (17-13); and the last play saw “sixty-seven thousand people standing. Standing. What an electrifying finish to a great season and a great game,” said Campbell. The Pack was at the enemy 22-yard line. “[Bart] Starr’s up over the ball. This will be it! Starr back to throw. He takes time. He throws over the middle! It’s caught at the 15 [by Jim Taylor]. Running hard to the seven-yard line. And down at the 7” – tackled by Bednarik. The gun went off. “The game’s over! The game’s over! The Eagles are the champions of the world!” It is how millions remember Bill. Shaw, Van Brocklin, and Bednarik retired. Surprisingly, Nick Skorich became coach. Campbell returned to his daily sports show at 6:10 P.M. and 6:40 P.M. on WCAU Radio and TV, respectively: already “an icon in Philadelphia broadcasting,” said Broadcast Pioneers of Philadelphia. 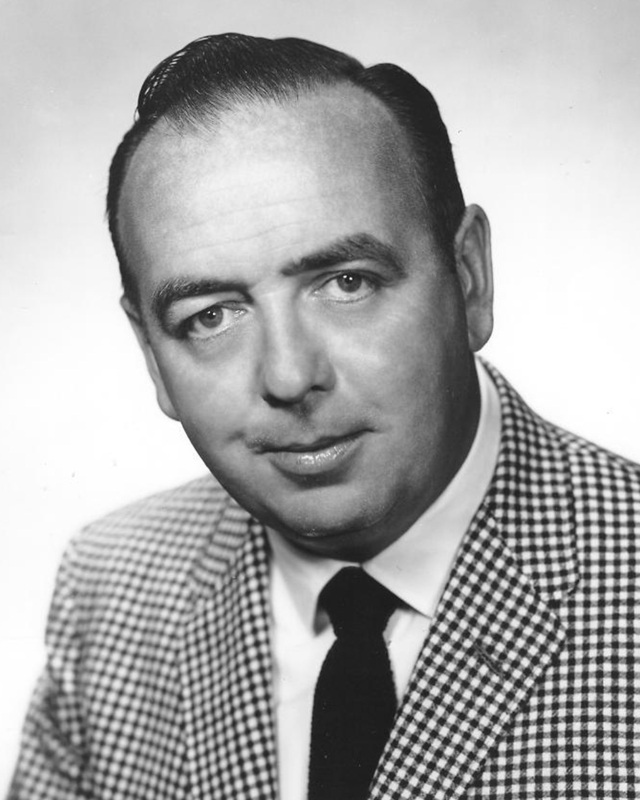 Another icon was the station’s 1950s and early ’60s news anchor, John Facenda – then “the Walter Cronkite of Philadelphia newsmen,” said Steve Sabol. In 1962 Sabol’s father, Ed, founded Blair Motion Pictures, later sold it to the NFL, and as NFL Films won 35 Emmies, “transforming the NFL,” wrote SI.com, “from a near newsreel to near art.” In 1965 Sabol Sr. hired Facenda as NFL Films’ first voice-over, which he remained until his death in 1984. When a writer complimented him on reading a script, Facenda said, “You gave me a good horse to ride.” In 1963 Campbell turned to a sport which soon unhorsed Philadelphia. Campbell had last called baseball re-creating the late-’40s A’s: “There’s a smash into the hole at short. Eddie Joost backhands, sets, throws – gets Rizzuto by a step!” He now joined Byrum Saam, in his 25th season, and rookie Richie Ashburn, on Phils’ radio/TV. Flagship WFIL 560 AM’s 22-station network was sponsored by P. Ballantine & Sons (beer), Atlantic Refining Co., R.J. Reynolds Tobacco Co., and Tastykakes, which also sponsored WFIL Channel 6’s three-station network, affiliates in Lancaster, Lebanon, and Scranton-Wilkes-Barre. Baseball's slow pace can reveal a Voice’s ignorance. By contrast, as Campbell showed, lifelong study helped him make the game seem more riveting than it was. By the early ’60s, Saam had forged a quarter-century of malapropisms. “And now for all you guys scoring in bed,” he observed one night from San Francisco. “By’d say the wrong thing,” said Whitey, “so innocent, then wonder why people laughed.” Saam’s all-time big-league loss total was less of a laughing matter: his 1938-54 Athletics and 1939-49 and 1951-75 Phillies, 3,239-4,395. By’s and Bill’s growing friction was no funnier. “The amazing thing is [how long they] co-existed,” Conlin wrote after Campbell was fired in 1970. Ashburn saving “the marriage more times than a neighborhood minister.” Saam was a company man; Campbell, good company. Whitey heard each complain about the other so often he “should have worn a striped shirt and a whistle.” Together, they endured the Phillies’ Gallipoli –1964. In 1957 Sports Illustrated reviewed Connie Mack Stadium: “Park is clean, brightly painted. Easily accessible refreshment counters [specialty is box lunch with fried chicken]. No beer is sold. Lack of beer in park prompts some Philly fans to bring their own in, and they usually bring plenty. Last season this resulted in an at least one near riot when irate spectators (for some strange reason, sedate Philadelphia has the rowdiest clientele in major leagues, as any rabbit-eared lawyer will testify) started to pitch empty bottles on field.”2 That year infielder Gene Mauch hit .257 for the Red Sox. In 1961, as the Phillies sold nee Shibe Park to a New York realty firm and soon expected to open a new park, Mauch became manager. His most memorable year was 1964, so affixed to him that even non-Quakers grasped the spoken tone reserved for a drunken spouse or wayward child. On September 20, 1964, Philadelphia led by 6½ games with 12 left to play. The Delaware Valley turned upside down. World Series tickets were printed. Store windows strutted player photos. A pennant – the Quakers’ first since 1950! Dream maker: Perhaps a Series title – the Phillies’ first! Callison, his three-run ninth-inning poke taking the All-Star Game, Allen, and Bunning stirred what that highlight film termed “WORLD SERIES fever.” Mauch’s fever differed: The regulars, especially pitchers, were exhausted. Out of nowhere the Phils began to ape a horse who, sans food and water, nears the finish line in shock and fear. Mauch started Short and Bunning five times on two days’ rest in a ten-game losing streak. The skein began on September 21 as the Reds’ Chico Ruiz stole home in the sixth inning to beat Philly, 1-0. Said Campbell: “His steal came with Frank Robinson the batter. It made no sense,” nor did the nonpareil debacle. Two more losses to Cincinnati ensued, 9-2 and 6-4, at Connie Mack. A four-game shellacking by Milwaukee capped a toxic homestand. In St. Louis the Phils then fell 5-1, 4-2, and 8-5. Philadelphia linked pursed lips and tightened jaws. Two games behind Cincy and St. Louis, the Phils rallied. By closing day – Sunday, October 4 – they trailed each by a game. “If we beat the Reds [at Crosley Field] and the Cardinals lose to the Mets, it’s a three-way playoff,” said Saam. “If we and St. Louis win, they get the flag.” The Cards cruised, 11-5, negating Philly’s 10-0 romp. Like pallbearers, 7,000 greeted By’s team at the International Airport. They would wait 16 years for a happier – saner – end: the Phillies’ first world title. Campbell never complained, preferring to stress the Quakers’ first 150 games: “That team played the best baseball of any team I’ve ever seen,” he said after the ’64ers became the gold standard for late-year collapse. Saam aired NBC Radio’s 1959 and 1965 World Series. Had the ’64ers not folded, By would have telecast half of NBC’s Series – sport’s then-Everest play-by-play. In turn, Campbell, known largely for basketball and football, would likely have added NBC Radio baseball to his résumé. Raised in suburban Wayne, outside Philadelphia, another man aired the 1975 Reds-Red Sox World Series for NBC. After the 1964 season, Sox Voice Ned Martin returned from a Boston road trip to find a message from his father. “Baseball had been our bond,” said Martin, “as it was when I last saw him in early September in Wayne. He was thin, and had had several heart attacks.” Dad died after mailing a letter “predicting the Phillies’ collapse, which had now come to pass. ‘I don’t see how they can win,’ he said. ‘They pitch Short and Bunning on panic and no one else. I’m afraid they’re going to crash.’ ” They had, as Campbell never forgot. Baseball, said a writer, was not a matter of life and death in Philadelphia. The Phillies, he added, were. The 1964 season had marked a Pickett’s Charge of pre-Mike Schmidt interest. Mauch was fired in 1968. The radio flagship became WCAU, anchoring a 25-outlet network. The Phillies on the air seemed to anchor the coming apart at the seams 1960s: Bill, By, and Whitey heard at the Jersey shore, in Amish country, returning from the Poconos. Above the field, same old seemed fine. On it, this was not true: The post-1964 Phils fell to seventh, then were fifth in 1969-70’s NL new six-team Eastern Division. The area around Connie Mack turned seedy. The ’69ers drew only 518,414 vs. 1964’s record 1,425,891. On October 1, 1970, the grande dame hosted her final game. In the tenth inning, the home team scored the winning run, at which point Phillies fanatics began to take seats, turf, and a toilet bowl. On April 4, 1971, Veterans Stadium – “The Vet” – was dedicated six miles away. The 56,371-capacity park was rounded, but rectangular. Also new: Harry Kalas, replacing Campbell on Phils’ radio/TV, leaving Houston to find Philadelphia up in arms. In December 1970 Campbell, arriving home, learned about his fate from Jo, who heard about the axing over WPEN Radio. It was, said his wife, “a shot in the heart. He didn’t even know it.” Team owner Bob Carpenter phoned to tell Bill no decision had been made, then called again to fire him. Daughter Chris Campbell recalls how dad began to cry. The Philadelphia Inquirer’s Frank Dolson bannered: “Firing of Voice Strikes Bad Chord.” Headlines raged: “Clumsy Ouster Widens Credibility Gap.” “Striking Out an Honest Voice.” Letters to the Daily News ran 13 to 1 for Campbell, a devout and gentle Catholic. Their tone was his antithesis: In the City of Brotherly Love, public rancor was the rule. How could the Phils ax such a Voice? One explanation was Schmidt’s replacing Ballantine as team beer sponsor. “Bill’d been identified with Ballantine,” said Bill Giles, then vice president, business operations; ultimately, chairman. “Schmidt’s wanted its own guy.” The club also OK’d a $13.5 million deal – “enormous money at the time,” said author Randy Miller – to drop 21-year TV flagship WFIL for WPHL (Channel 17). Kalas was 34, Campbell 47. Did Giles – Houston’s promotions director and Kalas’s boss before joining the Phillies in 1969 – want a younger man for television? ”We knew each other well,” said Harry, “and in late ’70 [Giles] offered me a job,” not saying that it was Campbell’s. “Bill was very popular, and for several years my confidence level faltered.” In time, it returned. Like Campbell, Kalas was the complete broadcast goods. His face belonged in the Vienna Boys Choir. The voice evoked a wrecker razing cars – to Bill Conlin, “a four-Marlboros into a three-martini-lunch baritone.” Ultimately, Harry’s “Long drive! … It’s outta’ here! Home run!” became outta’ sight, Kalas, a minister’s son, packing Philly radio/TV pews. Many wished Campbell still ministered, too. “I never had bitterness toward Harry,” said Bill. “We were good friends and went to some basketball games together. I’d have liked to have worked with him.” Instead, WCAU hired him the day that Carpenter pulled the trigger. In 1971 Campbell was hired for road TV by the cross-state Pirates, soon finding he would rather be in Philadelphia. Next fall he began a nine-year stay with the NBA ’76ers: Paraphrasing the ’62 Mets’ Casey Stengel, no one on Philadelphia’s 9-73 1972-73 team could play this game. “It was the only year where I didn’t want to go to the arena,” Campbell said. Later learning that the Seattle SuperSonics had been trying to get coach Tom Nissalke fired, Campbell found the ’76ers “couldn’t even beat a team which was attempting to throw the game. They threw the ball all over the place and we still lost.” Bill also did 1978 PRISM cable play-by-play and 1981 pre- and post-game WCAU radio. Later, Bill did talk radio on his first Philly stop, WIP – “truly full circle” – then voice-overs, weekly gigs, and thrice-weekly wildly popular KYW 1060 AM commentary. In 2009 Campbell joined the station’s Friday Reporters Roundup show. Awards lengthened like 1964’s losing streak: 1961-63, National Sports Broadcasters Association Broadcaster of the Year; 1987, Pennsylvania Sports Hall of Fame; 1989, Philadelphia Sportscasters Award, Outstanding Service; 2004, Philadelphia Sports Hall of Fame, Legacy of Excellence; 2005, Basketball Hall of Fame, Curt Gowdy Award; Philadelphia Broadcast Pioneers, Person of the Year, 2008. Even so, what-if lingers. The New York Yankees’ 1953-56 Mel Allen, Red Barber, and Jim Woods are often called baseball’s best broadcast trio. What if, hiring Kalas for 1971, Giles had insisted that Harry join, not replace, Campbell? “That’s what I thought the job initially was,” said Kalas. Failing that, segué to Saam’s late 1975 retirement. What if the Phils had picked Bill, not Andy Musser, to replace him – forming a 1976-97 Magi of Kalas, Ashburn, and Campbell? Who would not dub that trifecta a peer of Allen, Red, and Woods? After Kalas died in 2009 of a heart attack, Phillies’ Voice Scott Franzke received letters “from casual listeners to those who didn’t miss a game, so many hoping that their kids, growing up, would discover a ‘friend’ like Harry.” Nothing, Franzke said, beat baseball for “making small connections with fans, day after day.” Bill Campbell was that kind of man. Bill Campbell died at the age of 91 on October 6, 2014, in Camden, New Jersey. Grateful appreciation is made to reprint quotes from Bill Campbell: The Voice of Philadelphia Sports, by Sam Carchidi (Middle Atlantic Press, 2006), and Harry The K: The Remarkable Life of Harry Kalas, by Randy Miller (Running Press, 2011). Virtually all material is derived from Curt Smith’s books Voices of The Game, Of Mikes and Men, Voices of Summer, The Voice, A Talk in the Park, and Mercy! A Celebration of Fenway Park’s Centennial Told Through Red Sox Radio and TV (Simon & Schuster 1992, Diamond Communications 1998, Carroll & Graf 2005, The Lyons Press 2007, Potomac Books 2011, and Potomac Books 2012, respectively). 1 Bill Conlin, “Striking Out an Honest Voice,” Philadelphia Daily News, December 11, 1970.